Becoming well-known because of its superb Cox type flavour and very heavy crops, Red Windsor (Malus domestica 'Red Windsor') is a frost hardy apple tree, especially at blossom time. It has very compact growth which makes it ideal as a garden apple variety. Easy to grow with good disease resistance, we recommend Red Windsor whole heartedly. This apple is the product of the cross between the apple varieties Cox's Orange Pippin x Sport of Alkmene and was first introduced in 1985. 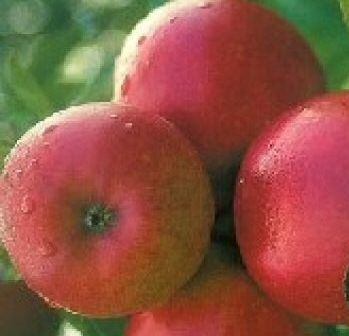 Considered good for juicing , growing across the UK and for Patio growing so if you are a Scottish apple juice addict living in a flat then the Red Windsor apple tree is for you. A good pollinator for other apple trees because of the abundance of blossom in the Spring. Self-fertile/Not self-fertile: This apple is self-fertile and does not require another apple to act as a pollination partner. This apple is in flowering period is C2.